Mompantero fraz. Urbiano, we offer a portion of a house consisting of two residential units. From the common courtyard, through an external staircase in masonry, you access the apartment on the first floor comprises entrance hall, dining room, kitchenette, double bedroom of generous size and bathroom with window. Particularly suggestive of the living area is the terrace, located on the south facade of the building, ideal for lunches and dinners in summer and spring. On the ground floor is located the second accommodation, consisting of a large living room, kitchen, two double bedrooms and bathroom with window. To complete the solution there are two covered parking spaces of exclusive property, the large storage room above the parking spaces and the two cellars in the basement. The main feature of the solution is the position, located in a hamlet context and therefore in a quiet and sunny area, but at the same time very convenient to the train station of Susa and all the services that the town offers (minimarket, bar, tobacconist, hospital, middle and high schools, etc.). 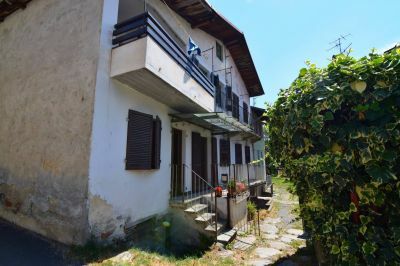 The property as well as being an excellent solution as a first home is also an excellent alternative as a second home or as an investment for a future B & B given the frequent presence of hikers and tourists attracted by the natural beauty, landscape and history that Mount Rocciamelone and the municipality of Mompantero offer.